First a disclaimer. These Chairman’s notes for the Sports Journalists’ Association’s Annual General Meeting 2016 will not carry any individual salutes to people who have made my three years tenure as Chairman so enjoyable – well, enjoyable for me! You are simply too numerous and in your wisdom I’m sure you’ll understand that by naming some, perhaps most, I still run the risk of offending others who might be inadvertently omitted. Suffice to say that when I succeeded my dear friend Barry Newcombe back in April 2013, I knew we all faced a tough challenge. 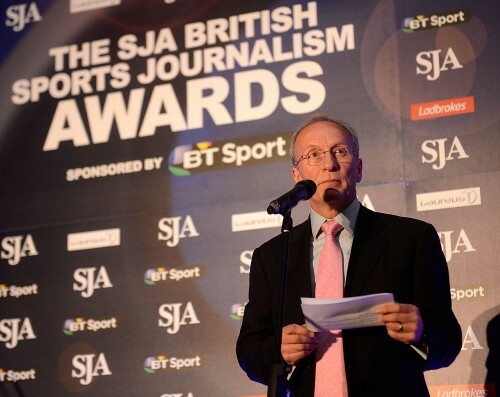 2012 had been an epic year for British sport and the feelgood factor from the London Olympics happily spilled over into the SJA’s Sports Awards and Sports Journalism Awards. I think I’m right in saying that the Sports Awards held at the Tower of London in December 2012 were the single biggest event we’ve ever staged. So how do you follow that? Well I’ve been blessed by having a General Committee and advisors who have stepped up to the challenge of self-critically analysing what we’ve done and achieved in the past – and then tried to improve on it. I’m delighted to say that at every event during my three years as Chairman members of our Association have independently offered their views that each awards dinner has overtaken the previous one as our best ever. To maintain this kind of standard – never mind make progress – takes some doing. Without undermining my opening disclaimer I think it’s fair to acknowledge the work of our event agents, Start2Finish, in making the big events truly splendid. As a team they have been superb. I think I’ve been on the General Committee for a decade so I can recall with some trepidation those dark days when we were desperate for sponsorship funds just to keep the organisation alive. It was our then President, Sir Michael Parkinson, who called on some of his best sporting sponsorship connections to dig us out of the mire. I agreed to make approaches to potential sponsors on behalf of the SJA and I’m proud of the progress we have collectively made with this regard. As a team we have created a feel good factor for the people who back our association. Our two headline sponsors for our main events have been The National Lottery and BT Sport. As I prepare to stand down as Chairman, I’m delighted to say that both have indicated their willingness to extend their sponsorships beyond their current agreements. That speaks volumes for the way they have been treated and the regard in which they hold the SJA. We shouldn’t forget the loyal backing we’ve received from Ladbrokes and Laureus. Both have played a significant part in us taking the association forward. For instance, it was at my first AGM as Chairman that I was asked from the floor whether we could do more for our provincial members. This directly led to the introduction of the SJA’s race day at York. A welcome opportunity to link up with northern members and this would not have happened but for the backing of Ladbrokes. 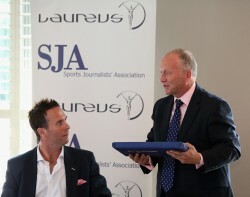 We’ve staged some memorable sports lunches with the likes of George Groves and Michael Vaughan. We’ve had other events that have not gone so well or provoked the same kind of demand for tickets. So we don’t get everything right. I hope it is seen as part of my time as Chairman that we do listen to members’ opinions and criticisms and take them onboard. The SJA is not all about social events either. Those who attended the Sports Journalism Awards in February will remember the tangible sense of unity expressed by a series of winners and presenters about the plight of some outstanding journalists at Independent Newspapers. I do understand why some people don’t want to enter awards but I defy anyone present that night not to be moved by the words of thanks expressed by our Sports Writer of the Year, Paul Hayward. A man who has overcome a massive personal health challenge yet appreciates what the SJA stands for as the Association that unites sports journalists everywhere. I truly wish our critics could have witnessed this. As I said, the SJA is about much more than handing out gongs. In his speech of welcome in February, Patrick Collins, our new President, raised the issue of recognition for women journalists. Patrick has brought a different, hands-on approach to his presidential role and that is helping to push the Association forward. The SJA has staged a number of debates in recent times and our latest was one of the best. It was about inclusivity in sports journalism, an issue that we know sparks responses from many quarters – women, people from minority ethnic backgrounds as well as gay, lesbian and transgender sports journalists. The SJA organised a stellar panel to discuss these issues at the home of Sport England. We had a large number of students, who are associate members, and younger journalists in attendance. It was a challenging debate and there was a dynamic to the evening that suggested people welcomed the way we were discussing some important issues. We must take this initiative forward over the coming months and years. There is no set period for a Chairman of the SJA to stay in office. My predecessor served for seven years. I always stated that I would stay – if accepted – for three years and then step down. It’s with a degree of sadness that that moment has now arrived. I’m happy to be handing over office to Andy Elliott, an old friend of some 30-plus years standing. The SJA is in good shape. Like all voluntary groups we will need the continued backing of the members of the largest independent group of sports journalists in the world. That is the spirit with which I am today stepping down as Chairman. Thank you to all those who have made my tenure so enjoyable and rewarding.